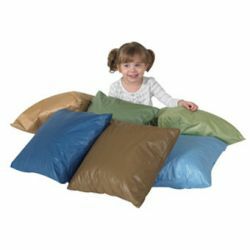 These six big, colorful Cozy Woodland Pillows from Children's Factory can be used in any number of ways plus the one you come up with. Let the little ones show you what to do with these kid friendly tactile discovery cushions. Measure 17" Square each.